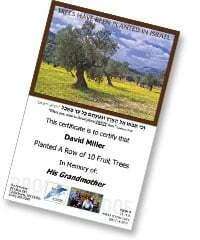 Help Israeli Farmers Recover by Planting Fruit Trees Today! FIGHT FIRES WITH FRUIT. THEY BURN, WE PLANT! Don’t delay – Plant your fruit trees in Israel today! They Burn, We Plant… Help Israeli Farmers recover from damage caused by arson fires! An opportunity to help farmers recover from arson fires and make the Land of Israel more beautiful.